TubeNet • View topic - new cruise ship: "American Song"
new cruise ship: "American Song"
I showed up today to play on the ship, and thought I may have screwed up (though I was certain that the text said the ship was to be moored at Beale Street Landing (foot of Beale Street, with the spiral ramp and floating dock). It is a BRAND NEW ($40M) Ship...NOT a sternwheeler cruise boad, but about the same size (actually: larger)...sort of a five-deck "cruise yacht". I'm pretty sure this was its maiden voyage...uber "new carpet smell". 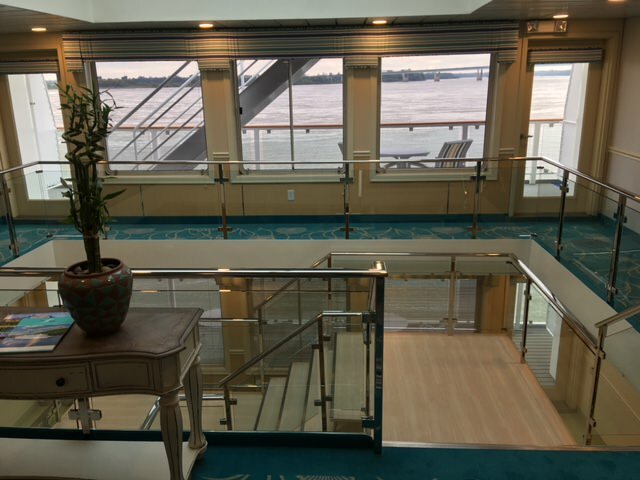 The lounge that we play in on this ship (instead of on the front of the second deck) is on the front of the FOURTH deck...up much higher. The lounge is a bit bigger than the lounges on the big sternwheelers...and the ceiling is much higher, rather than only a flat 8-foot ceiling (so better sound). Count up to the fourth deck in the picture, notice where there are many windows close together on the front third of the fourth deck, and you'll see where we play. The center staircase/elevators is glass-glass-glass and spacious. I think I like the sternwheelers better, but this is really sleek and (though the sternwheelers are only built to LOOK old) modern. Re: new cruise ship: "American Song"
I dig the smaller ships. More expensive though. The gig was the same as always, with mostly the same type of people - though some appeared to be a bit younger than usual. 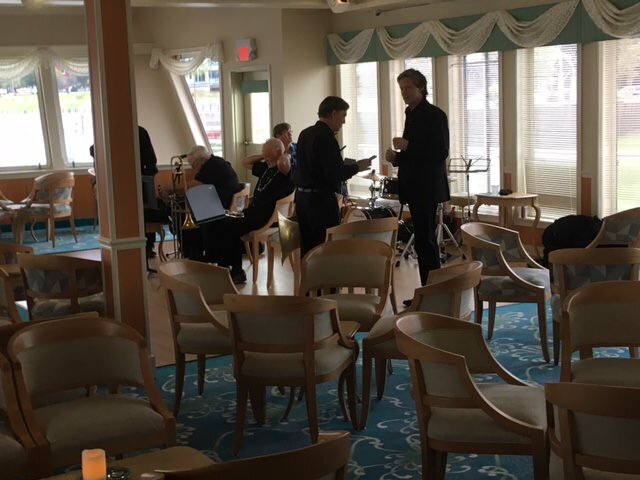 ...On one of the sternwheelers in its lounge, I recall an incident where an old lady told me that I should consider polishing my tuba a bit more often. I retorted by suggesting to her that she ought to pull up her pantyhose, so they wouldn't appear so wrinkled. She then told me that she wasn't wearing any. 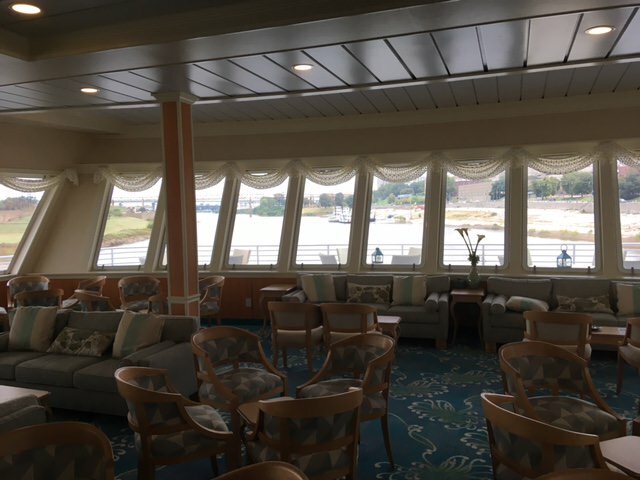 Rather than a bunch of dark wood, multicolored upholstery, and whimsical decor (as is experienced in the sternwheelers), we were surrounded today by a lot of white and a lot of glass. I'm not much of a picture-taker, but I realized today that I did snap three pictures total: from inside the lounge and from the top of the stairwell. The guy (Dan Knowles (blue shirt in the back nearest the door to the outside) actually stays with the cruise, sings, tells, stories, and teaches banjo beginner class lessons to anyone who is interested. Not "officially" a member of our jazz band (and this is probably his first-ever delve into any flavor of "jazz" music), he also offers to help haul garbage on the ship, and do most anything (no extra pay) to fight off boredom. Beginning a couple of years ago, he began sitting in the back of the lounge and listening to all of our Saturday morning boarding-time gigs. ...but now (as explained above) we have a guitar AND a banjo on these cruise-boarding gigs, and the two of them are referred to (when introducing the band) as the "Wire Choir". It works out, because the guitar player can now play single-note solo choruses (i.e. melodic), while the banjo guy (again, who stays with the entire cruises) keeps the chords going. The tall/slim guy in the picture Jim Pettit (who, it appears, might possibly be receiving his payment) is the owner of the venerable Memphis Drum Shop. If you have any percussion friends, they have likely heard of the Memphis Drum Shop, just as they've heard of Lone Star Percussion. As long as I'm yaking about the band, the trombone player is the band leader, Howard Lamb, who is retired from the Navy Commodores as the former lead trombonist. We usually give Howard a smooth 4/4 beat for his choruses, to match his style of playing. Howard has some pretty good patter that he offers (jokes, stories, fake-stories-that-are-jokes, self-deprecating remarks about himself, insults towards the rest of us...occasionally joking insults towards good-natured/loud-mouthed guests, etc.) that he offers to the folks in-between numbers in a low-key and almost-vocal-fry-but-not voice. Being from North Carolina, he has the appropriate accent and inflections for the patter as well. Nerd-info-wise, Howard plays a very old Bach 12 trombone. ...and yes, Three Valves, its quite small as far as cruise ships go, but - docked at the foot of Beale Street on the Mississippi River, it appeared pretty darn large...and even with the River being low (as much lower, the ship would have had to have been docked at the secondary or even tertiary docking location), and even with Memphis sitting up very high on a bluff (which is why - with the town almost never flooding, due to the bluff - Mrs. bloke's direct ancestors, the *Winchester's, established the trading post and ship loading/unloading location, which they named "Memphis" - after the Egyptian city on the Nile, there) that ship loomed up pretty high. Last edited by bloke on Thu Oct 18, 2018 10:25 am, edited 1 time in total. I’ve always loved getting dressed and going to swanky parties. ACL has a similar ship we see in the N Chesapeake Bay. 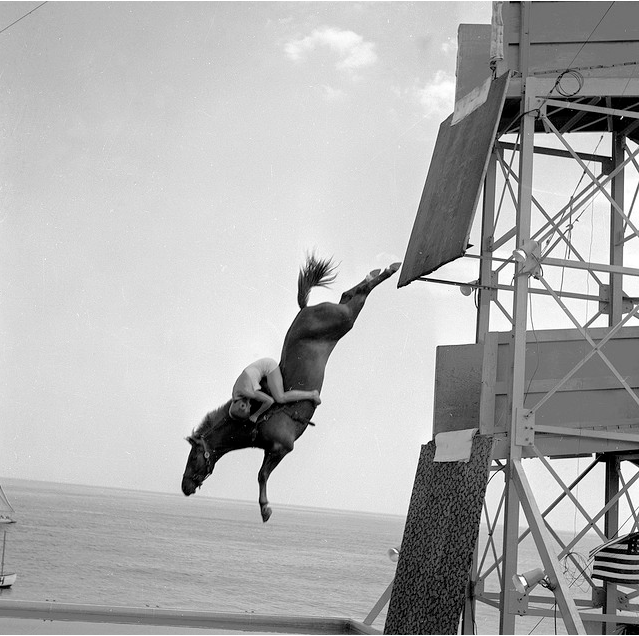 We’d like to hop aboard one day and go to New England for the post hurricane season Fall tour. Three Valves wrote: I’ve always loved getting dressed and going to swanky parties. Our cruise line learned - after the first year - to avoid July/August/early-September cruises (too hot and humid) and also to avoid mid-December through - early March cruises (though in "the south"...too cold, until the ship makes it down to around Natchez). ...so we work roughly half the Saturdays each year, PLUS there are now (with these new yacht-style ships also being introduced) some Tuesday jobs added in. bloke "For those who do not know, Three Valves is a boat/ship aficionado." But my real talent is fluid mechanics!! Three Valves wrote: But my real talent is fluid mechanics!! Including super fast evacuation of beer from a yard glass? Please, I’m a 56 yr old man. I haven’t done anything that immature since I was 40!! Three Valves wrote: Please, I’m a 56 yr old man. Politics are banned here, but we all know which enclave engages in handwringing over being "green". that water is required to additionally wash a stein, mug, or glass vs, (simply) washing a pitcher? and just drink out of the pitcher (or keg), please, sir ! For the ships enthousiasts, I have played few gigs with a brass quintets on board this gem: Steamship "Concordia" built in 1926 by Odero Shipyard in Genova, and still in regular service on Lake Como. One of the oldest steamboats still working in Europe's internal waters. It has 2 wheels amid quarterdeck. Everyone was wearing shoes...I suspect you would have appreciated that. re: clientèle... One never knows, but it just appeared as though (on this yacht-like cruise ship, as opposed to the typical sternwheeler ship cruise clientèle that I've been seeing over the past few years) that some of the old guys had probably (several years ago) traded in their bosses for younger ones. 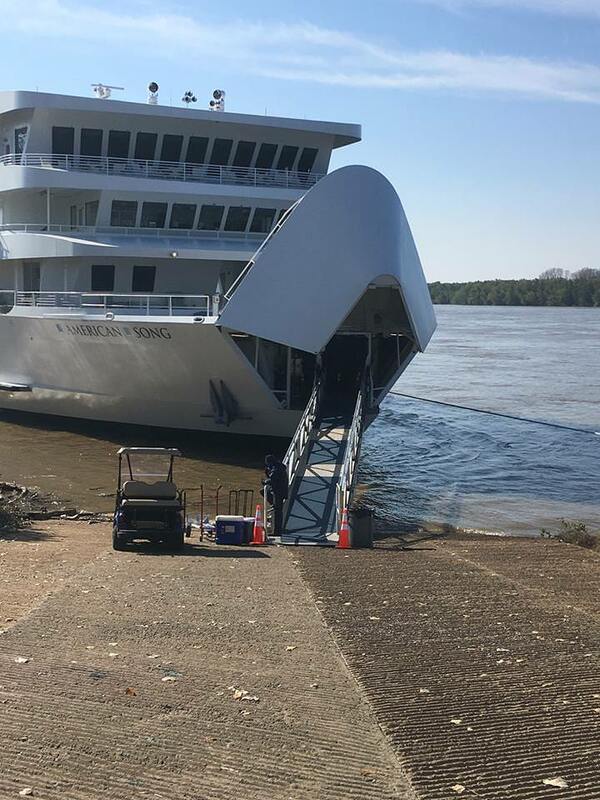 When the River stage is too low, these deep-draft ships must move to alternate Memphis docking locations (other than the adjustable-down-about-30-feet-or-so Beale Street Landing). Today, the passengers boarded a couple miles north of Beale Street at a place called "The Greenbelt". Just behind "The Greenbelt are fancy newish houses in an area called "Harbor Town" were NO ONE ever built houses before - due to occasional flooding, and - yes - those houses occasionally flood. Anyway, this docking location requires the use of an old-school gangplank, and The American Song (a bit oddly) features a hinged "nose-cone" which elevates to reveal a stored gangplank and alternate entry to the ship. Again, the top deck (slanted windows facing forward) is where the lounge in which we play is located. Today's *hors d'œuvres ...smoked salmon pâté in little pastry cups, some fancily-prepared fruit, some pastries (eclairs and fancier stuff), and hot chocolate spiced with Kahlúa and (well...) with Hershey bar squares in an adjacent dish. I don't much care for Salmon pâté...but actual SLICES of smoked salmon (in the center of the huge plate) were fashioned in to the shape of a rose...so (well...) after the passengers were ordered to their staterooms to watch the safety video, I made those slices of smoked salmon disappear. Building homes where it floods. Weakening the area of a ship where it should be its strongest. Three Valves wrote: :tuba: Building homes where it floods. > I neither own nor insure any of those houses, and nor do I pay *taxes in the city that possibly subsidizes any losses that those homeowners may incur due to stupidity involved in site selection. > When that ship is negotiating its way down the River, I am not on it, and have already disembarked from it with funds in my pocket covering roughly 3 dollars for each minute of time I spent working on it when it was docked. > All is right with the world...of bloke. Check out the area where the fancy-new-ish Mississippi Riverfront houses are that occasionally flood..."Harbor Town". THEN notice the name of the peninsula (former island)...MUD ISLAND. There is a REASON why it was named MUD ISLAND...because it would often FLOOD. To the right (on the map), you see "Wolf River HARBOR". 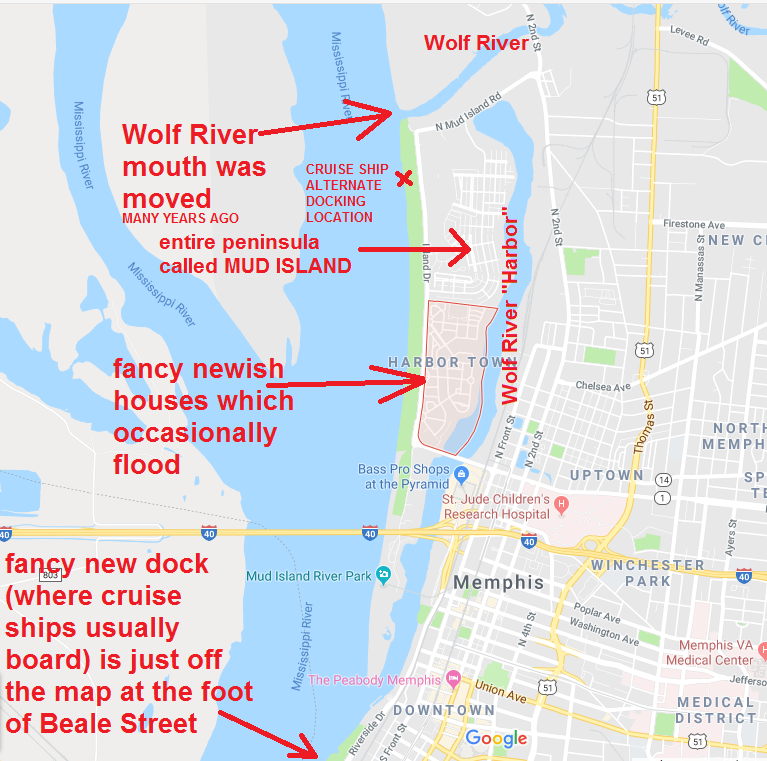 Wolf River is a tributary (feeds into) the Mississippi River, runs westward, and finally runs westward around the north side of Memphis before emptying into the Mississippi River. Years ago, a NEW MOUTH was cut for Wolf River (NORTH of MUD ISLAND, and NORTH of this map), which is why that water on the right side of the map is now named "Wolf River HARBOR", rather than (simply) "Wolf River". That was when MUD ISLAND became a peninsula, and was no longer an island. - I'm fascinated with these ships (as they are a completely new thing for this region). - I'm fascinated with this gig (as it seems - ?? - to be oddly expanding into a semi-job, rather than - per the typical gig) slowing/quickly sinking in the west. - The band is fun. We're not amazing, but we have fun, and we seem to obtain smiles (or - at least - puzzling looks ) from some of the tourists...many of whom are international. There seems to be a different vibe/aura. When in the 2nd-deck lounges in the sternwheelers, the passengers nearly always seem to be very engaged. With the newer big white ship (larger 4th-deck lounge/higher ceiling) we seem to function more as "background". Additionally, the passengers on the white ship - at least, so far - seem to average 10 - 15 years younger.